← New (and old) videos on the website! This book is coming out in the autumn. It is about Shelter Theory, a new theory in small state studies, and Iceland’s External Affairs, from the British and American occupation in the Second World War to the present. It contains detailed analysis of Iceland’s relations with the United States, the Nordic states and the European Union. It also discusses Iceland’s shelter options in the future and its cooperation with China, Russia and Britian in a post-Brexit world. The research team included Sverrir Steinsson, Þorsteinn Kristinsson, Dan Devine and Tómas Joensen and the concluding chapter ‘Why Shelter Theory Matters: Ramifications for International Relations and Small State Studies’ is written by my wonderful colleagues Anders Wivel and Christine Ingebritsen. 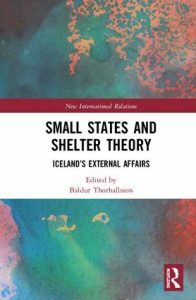 More information Small State and Shelter Theory: Iceland's External Affairs.